This past Saturday, I had the pleasure of attending the 7th annual Future of Food and Nutrition Graduate Research Conference at the Friedman School of Nutrition Science and Policy at Tufts University. Organized and run by Friedman graduate students, the conference was as engaging and polished as any put on by a professional organization. Graduate student research dealt with a host of topics both international and domestic, ranging from food access, food prices, and property values near grocery stores to behavior change and breastfeeding. Presentations that I attended also explored childhood obesity in Indonesia, regional U.S. food systems, and the latest in molecular nutrition. Students came from diverse backgrounds, including not only nutrition policy, biochemical and molecular nutrition, public health, and medicine, but also environmental science, agriculture, economics, urban and environmental planning; not to mention food studies and gastronomy as well. Collectively, presenters brought valuable multidisciplinary perspectives to the topics of food, nutrition, and food systems. While distilling a twenty-page paper into a poster was a challenge I had not previously encountered, poster presentations do have their advantages. As I have been counseled by my professors, presenting a poster rather than a panel talk does provide greater opportunity for conversation, feedback, and the sharing of ideas. 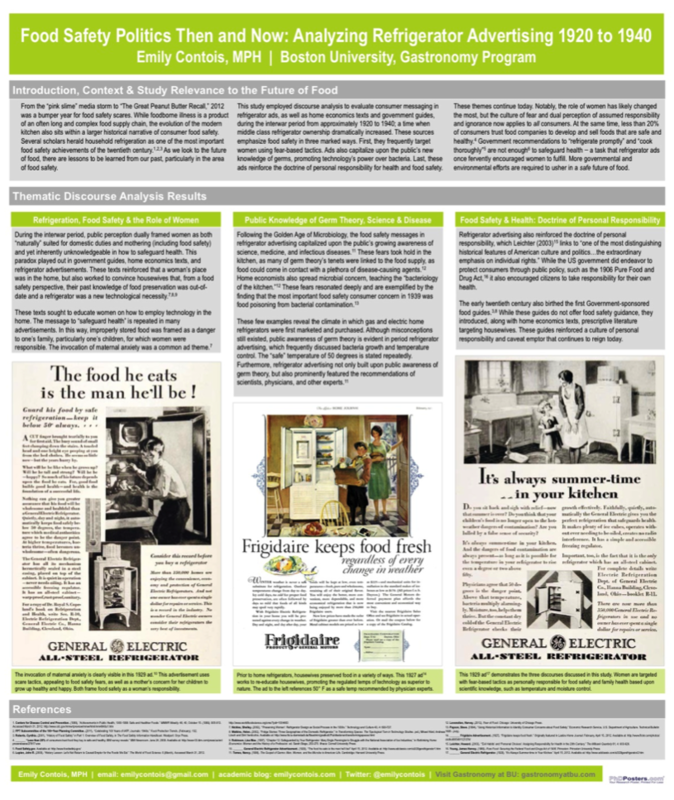 I was pleasantly surprised and truly delighted by how receptive conference attendees where to tracing the historical narrative of consumer food safety messaging—a less traditional topic for a nutrition science and food systems conference. These one-on-one and small group interactions reinforced the focus of the final expert panel (featuring Jason Reed of Hunger-Free Minnesota, James Harrison of The Food Project, and Emily Broad Leib of Harvard Law School Center for Health Law and Policy Innovation) and the overall theme of the conference—that the future of food and nutrition will be multidisciplinary and depend upon multi-sectorial collaboration.